This colorful pictorial map of the USA features myriad of the country’s industries, but focuses on the mineral extraction processes which so significantly contribute to the nation’s economy in the mid-20th Century. From coast to coast are depicted abundant natural resources such as gold, silver, aluminium and oil to name a few. The industrialization of the country is also depicted with a wide variety of manufacturing centers illustrated, such as clothing and shoe factories, oil refineries, atomic industries, automobile production, etc. The tourist industry is represented, and shipping is seen to be an important mode of transportation for industry, as are the railways. Flights are seen arriving to and departing from the country. 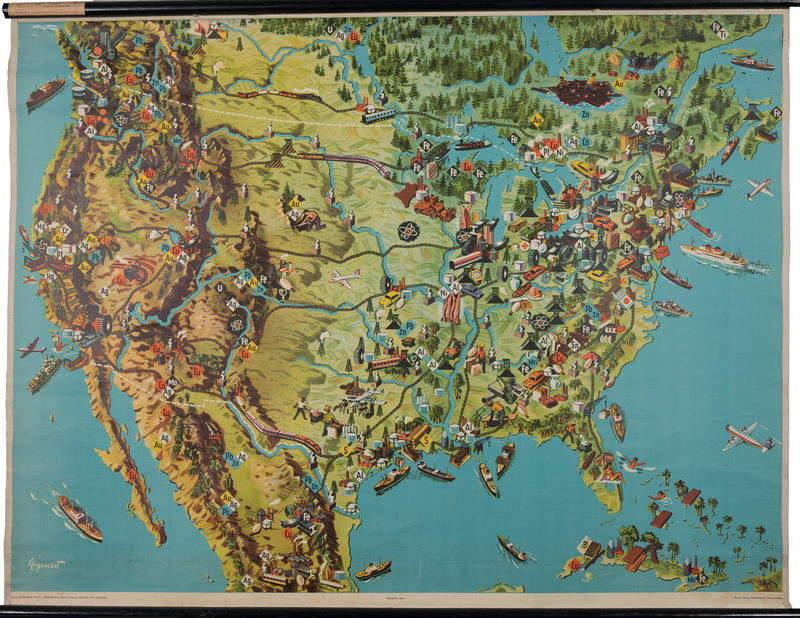 The map evokes a sense of great energy and expanding economic frontiers for postwar America. Condition: This map is in B+ condition. The side edges have been reinforced with archival material. The dowels are solid and show little sign of wear, and the self-tie and heavy duty cord for hanging are in good condition.